Members of the Greencastle and DePauw communities met in the basement of Gobin Memorial United Methodist Church on Jan. 26 to discuss a possible relaunch of the Greencastle chapter of the National Association for the Advancement of Colored People (NAACP) which became inactive 10 years ago. Greencastle residents and Depauw students, staff, and faculty were in attendance. According to Indiana NAACP President Barbara Bolling-Williams, an official branch needs to maintain 50 members in order to be considered active. One Greencastle resident, Russell Harvey, said the branch is needed because when the bias incidents happened on campus there was no place for community members to go. “It’s just really scattered, the only way to really do anything and have any real impact is to have a solid platform, and the NAACP is a way to do that,” Harvey said. According to Harvey, one of the main goals of the meeting was to create a voice for students on campus and give them a chance to have an impact. 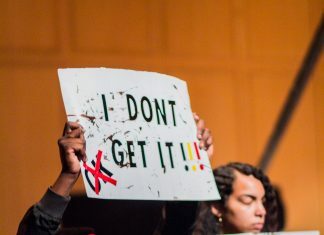 “Personally, I would like to see a branch that includes students because I think if we had that, where it crosses the Greater community with Greencastle and campus, we could definitely be collective in our efforts.” Harvey said. First-year D’Angelo McDade went to the meeting because he experienced racial bias incidents at DePauw. McDade wanted a clear plan of action. “My thoughts of going to the NAACP meeting was that there’s a clear agenda.This agenda will help one create a justified environment for African Americans and people of color in general to live in.” McDade said.